War crimes, potentially crimes against humanity, are likely being committed in east Ghouta and elsewhere in Syria, and the United Nations human rights chief warned on Friday that the perpetrators of these acts must know they are being identified and will be held accountable. “Civilians are being pounded into submission or death,” the UN High Commissioner for Human Rights, Zeid Ra’ad Al Hussein, told the Geneva-based Human Rights Council during an urgent meeting on situation in east Ghouta, where some 400,000 civilians are trapped amid daily airstrikes, shelling and the reported release of toxic agents, which have killed and injured hundreds of people in the past two weeks alone. He said that over the past four months, some high-profile perpetrators were brought to justice: Bosnian Serb General Ratko Mladic was convicted of genocide; Salvadoran Colonel Inocente Orlando Montano has been extradited to Spain to face charges related to killings in San Salvador in 1989; and two Argentinian former Navy Captains, Alfredo Astiz and Jorge Eduardo Acosta, were convicted for crimes against humanity committed between 1976 and 1983. “The wheels of justice may be slow, but they do grind,” Mr. Zeid said, noting that the Human Rights Council can have a real impact in ensuring that there will be justice – determined, inescapable and effective – for the suffering that has been inflicted on the Syrian people. He also said that Syria must be referred to the International Criminal Court (ICC), urging all States to greatly increase their support for the International, Impartial and Independent Mechanism (IIIM) set up last year with its mandate focused on ensuring that information about serious crimes is collected, analyzed and preserved, with a view to furnishing dossiers for future prosecutions. 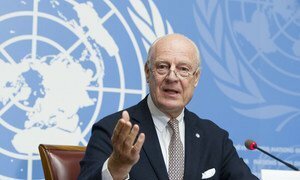 He also strongly encouraged the Council to renew the mandate of the Independent International Commission of Inquiry on Syria. Meanwhile, the UN Children’s Fund (UNICEF) on Friday called once again on those fighting on the ground inside Syria and all those who have influence over them to put their arms down and stop the war on children. “Is our call falling once again on deaf ears? The children of Syria have been waiting for way too long. The world has failed the children of Syria so many times…,” Geert Cappelaere, UNICEF Regional Director for the Middle East and North Africa, told reporters at a regular briefing in Geneva. Nearly a week ago, the UN Security Council unanimously adopted a resolution that would have created an opportunity for hundreds of thousands of children to finally get respite from the brutal and unabated violence they have been living through. “We all thought this was an excellent window for UNICEF and other partners to deliver urgent and lifesaving assistance to children in need wherever they are inside the country,” he said. “But as the days went by, these hopes turned into illusions, the windows shut abruptly in our faces,” he added, noting that violence continued in several places across the country, escalating in some and flaring up in others, despite the resolution’s call for a 30-day ceasefire.